Children, no more than 3 years old, pretend to be cowboys as they ride their tree branch horse. A mother bathes her young daughter outside of her tent. Down the arid slope two others nurse their babies under a tree. The women ask Sister Fidela Borquez for Nido, powder milk, for their babies. Borquez, a Catholic nun who visits regularly to check in on them, takes out a small notepad and quickly jots down names and ages: Joaquin, 9 months, Maria 12 months, Violeta, 7 months. “I will try,” she replies. She can’t make promises. Between 500 to 1,000 adults and children, most of them Saharan Africans, live in this quasi neighborhood made up of more than 300 tents—living quarters erected with green and blue tarps. Bolingo sits under a man-made forest at the foothills of Nador, a coastal city that is located 10 miles from the Spanish enclave of Melilla. 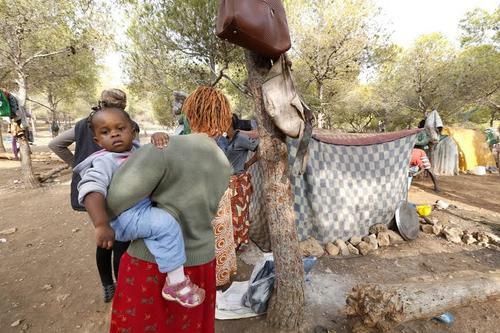 Bolingo, a Congolese word meaning love or friendship, is a pit stop for the hundreds of African migrants on their way to Melilla, a Spanish city that sits on the northern tip of Africa. It borders Nador, but immigrants primarily see the port city as a gateway into Europe, especially to France and Germany. And as more people flee extreme poverty and violence with their eyes set on Europe, the pressure to stop them grows stronger. That pressure, which fuels the polarizing political discourse dominating pre-election debates in France, Germany and throughout Europe, is mounting against profound demographic forces underway in sub-Saharan Africa transforming migrant flows. As documented in a recent International Monetary Fund report, the population of the sub-Saharan region will not only more than double —from about 900 million in 2013 to 2 billion in 2050—but also the working-age population that typically becomes migrants, will increase even more exponentially—from approximately 480 million in 2013 to 1.3 billion in 2050. While migrants and immigration from the Middle East and Afghanistan have dominated Germany’s headlines, sub-Saharan Africa is poised to become an even larger challenge for European policy-makers. Bolingo is now a small wayfarer island on the tip of North Africa; that will change and have profound consequences for Germany and the rest of Europe. In the 1990s, Morocco became increasingly popular as a transit country for sub-Saharan Africans, and Moroccan and Spanish border patrols monitor the perimeters of Melilla to prevent the migration of undocumented migrants. 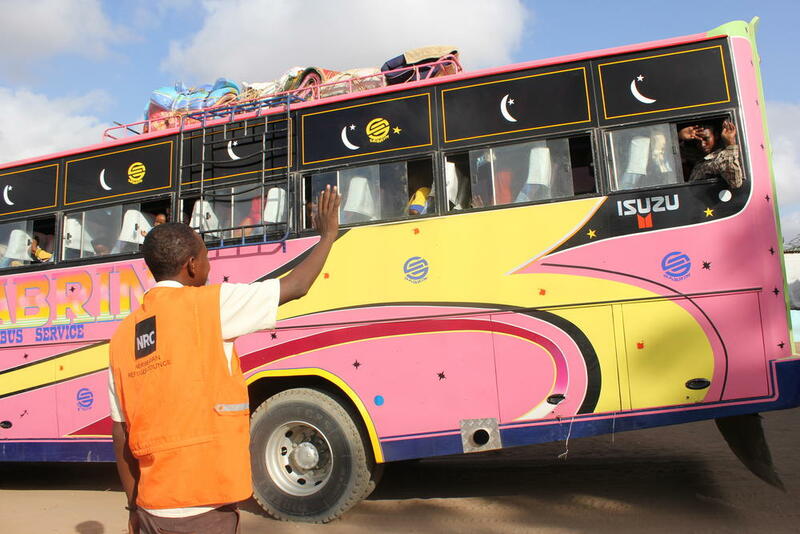 They travel from as far south as the Democratic Republic of Congo, and as close as Niger and Algeria. They try to escape poverty, political upheaval or persecution. For them, reaching places like Germany is a lifetime decision, not a temporary refuge. More than 1 million migrants and asylum seekers have arrived in Germany every year since 2012, reaching nearly 1.5 million in 2014, according to data from the Washington D.C.-based Migration Policy Institute. But the trip from Nador into Melilla, even though it’s only six miles, can be brutal. They have to make it across three layers of a seven-mile razor wire barrier topped with barbed wire reaching twenty feet tall. Infrared cameras, motion sensors, along with Spanish and Moroccan officers, patrol the border 24 hours a day, seven days a week. People come to Nador for many reasons, though overall the share of migrants classified as refugees escaping violence has fallen dramatically since 1990. According to the International Monetary Fund, in 1990 about half of total migrants were refugees; this percentage dropped to about 10 percent by 2013. Oumar is a 25-year-old from Guinea who arrived in Bolingo in July and four months later is still waiting for an opportunity to cross the border. He asked to not be fully named in fear of being identified by authorities and arrested. “In Guinea I was a [college] student, but my father died,” he says through an interpreter. He sold part of what he left behind and used that money to take a plane and train to get to Nador. “My mother is going to sell some of my father’s land and send me the money in order to continue,” he says. He communicates with her and his siblings through Facebook. Despite the wait and his bleak surrounding, he says he has faith that he can make it to Europe. Veronique, 43, hasn’t given up either. She left the Democratic Republic of Congo with her youngest child, a 3-year-old boy. Her sole reason to immigrate is to seek medical attention, she says. A mass the size of a golf ball grows under her left ear, causing constant pain, headaches and blurred vision. After two surgeries in her country, the benign tumor returned. Her only hope is finding a better doctor in Europe. Faith is also what keeps Agnes Martin going. The 30-year-old has lived at the makeshift camp for nine months. She left her native Sierra Leone with her husband but he abandoned her once they got to the camp. She wants to make it to Europe and sing, but first she needs to save at least 5,000 euros for the rest of the journey or maybe even to return home where her children are. After her husband left her, a stranger who has since left Bolingo to cross the border, gave her 120 euros (about $120), which she immediately invested to start a business selling non-perishables and some vegetables—right outside her tent. She also cooks a free meal every day for all her neighbors. The increasing number of migrants trying to cross into Europe has put more pressure on border police to stop them before they make it further inland. 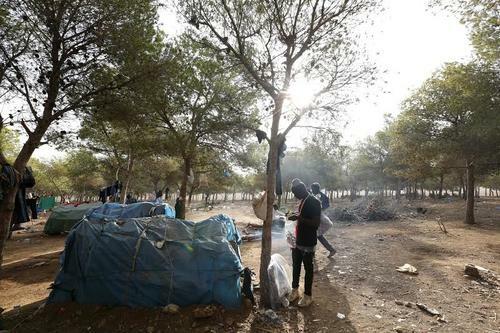 In the areas surrounding Nador, police have been known to raid makeshift migrant camps, frequently looking for unauthorized migrants. Borquez, and the other nine members of a multi-ethnic, multi-denominational team, have seen it all as they visit the encampments. The team is united by one mission, they say: provide aid to the needy in Nador. They estimate at least 20 migrant camps exist. A life in the outdoors means migrants lack even the most basic necessities such as clean water, electricity and bathrooms. They are often exposed to the cold and rain, with their homemade tents unable to keep the water out. Far from city centers and with no transportation, they have no regular access to medical services, and shy away from schools for fear of being noticed and detained by the police. Many, having saved up everything they could to escape poverty or persecution, find themselves vulnerable again in unchartered territory where they don’t speak the local language. 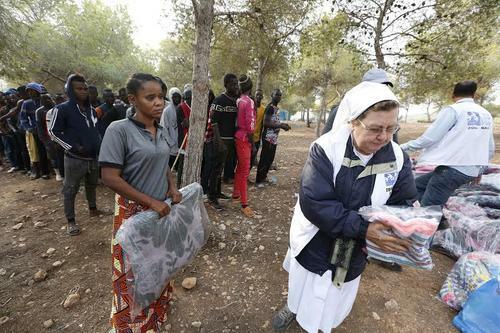 The nuns, part of the Migration Delegation of the Archdiocese of Tanger, in Nador, serve an area where less than 1 percent of the population is Catholic. Although the Moroccan government allows the nuns to provide their relief efforts, the tight government control on religious preaching keeps them from spreading their beliefs. “Our mission at this border is to help, not to preach,” the nuns say. When needed, one of the nuns tends severely injured immigrants who are treated and released from the local hospital and have nowhere to recover. Recently she helped a man who lost half of his foot due to gangrene after he fell from the border fence and injured his leg. In the midst of the chaos, the nuns try to make the immigrants’ lives a little bit easier, a little bit safer. The occasional visits serve as a way to connect with the immigrants, Borquez says. All of this is to help people to have an actual choice about whether to migrate or not, the nuns say. Teaching them trade skills gives them another opportunity to remain in their home country as opposed to finding their luck across the border. On the other end of the church, Moroccan women learn how to sew and serve as translators and facilitators for others in the class. They learn how to do pattern work, stitch, cut and sew. Some of their children, along with other community kids, join a nun who coordinates lunch and about three hours of school instruction. This too is done with the help of local volunteers. Children are divided into groups, from preschool to fifth grade, while older students, primarily teen boys, take language courses and trade skill training. 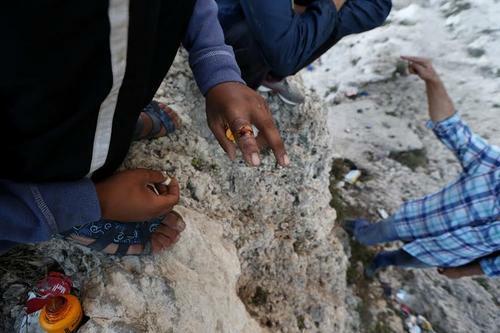 There are many ways migrants try to reach Melilla from Nador, but the most popular is by storming in large groups, climbing the fence with wooden ladders or pulling themselves up the chain link fence. Increasingly, border crossers have complained of police brutality as a way to stop them from jumping over. Anthony, who traveled by foot and car over hundreds of miles from his home in Guinea, said he tried to climb the fence around Melilla more than six times. On a hot day in August, guards beat him with wooden batons, even though he had dropped to the ground and the fall had stunned him; he was not resisting or trying to escape, he said. According to his account, police took him to the hospital, where he remained for two days before being released on crutches. Months later, on his fourth attempt, officials hit him with a stun gun, he said. Eventually he made it across and is right now on his way to Germany, where two of his uncles immigrated four years ago and they are promising him a job. Videos released by the immigrant human rights group, Pro Derechos de la Infancia de Melilla (Prodein), show an immigrant repeatedly hit with a baton by an officer from the Spanish civil guard. After a blow to the head, the man crashed to the ground unconscious. When asked about the alleged beatings of migrants, Juan Antonio Martin Rivera, a spokesperson for the Guardia Civil (Spanish Civil Guard) said that videos can often be manipulated, giving the guards a bad reputation. No Spanish officials have been indicted and no one has resigned after the alleged beatings. But neither the danger nor the alleged beatings deter migrants from attempting to cross into Melilla. The possibility of arriving in mainland Spain, of being one step closer to Germany or France is always stronger. In fact, attempts to enter Spain through Melilla and Ceuta, often in large groups, have increased since 2014, officials said. As of November, about 1,250 migrants and asylum seekers were being held in the migrant reception center in Melilla, which has a capacity of 480. 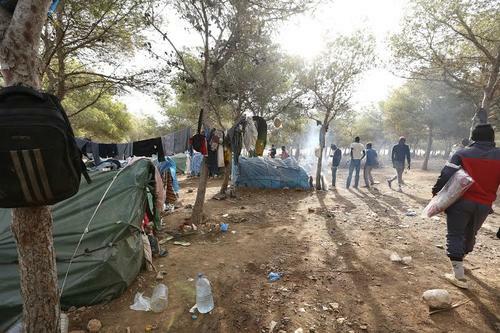 Persons irregularly entering the Spanish territory are placed in one of the two Migrant Temporary Stay Centres before being transferred to the mainland. The two centers, counting a maximum capacity of 512 places in Ceuta and 480 in Melilla, face systematic problems of overcrowding. In October 2015, Melilla was hosting 1,156 persons, while its average occupancy in 2014 was 1,338 residents, according to the Asylum Information Database 2016 report. While hundreds find shelter at the local reception center in Melilla, a port town with more than 80,000 residents, other migrants are on their own. 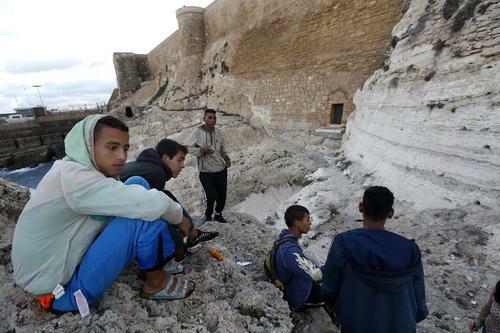 A few Moroccan teens 15 to 18 years old have set up camp inside caves formed by the ocean, waiting to risk their lives once again, as they seek the right opportunity to jump into a cargo or passenger ship that can place them in mainland Spain. Hidden from the port’s main view, they cook whatever they hustle to find. On a recent day, they sautéed in a blackened pot potatoes, onions and tomatoes.